As a busy family, organisation is something we (try) to get right in our home. Dashing to and from work, off to extra-curricular activities, children with school bags, nursery bags, dancing bags etc - it constantly feels we're running out the door and having to scramble around to grab belongings to make a mad dash to get our destinations. So having an organised hallway is very high up on my to-do list this summer. Places for shoes, coats, gloves, keys, and bags are just a start. What about somewhere to sit while you’re putting shoes on? Where does the damp umbrellas hang out, or scarves, or your phone, or… the list is endless, really. 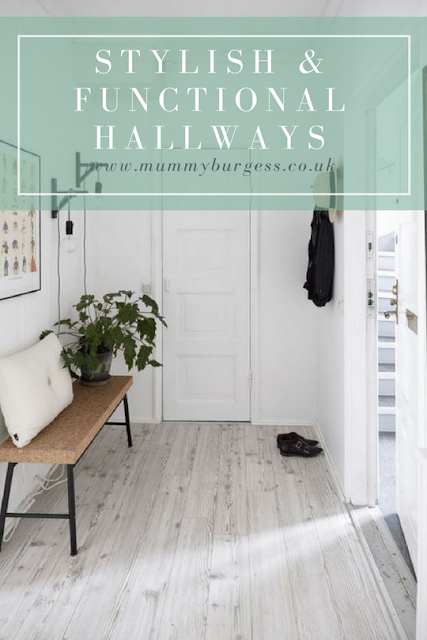 While there’s not a one-size-fits-all way to organise those items in each hallway but there are certainly endless ways to go about customising your hallway storage to fit your life and needs. My tastes and styles have changed dramatically over the years. From rustic country to my new found love of Kinfolk and Scandinavian interiors. The latter is something I would love to inject into our hallway and landing space. Though as much as I want a pretty space, practicalities is my main priority. One of the first jobs will be to paint the entirety of the hallway, stairs and landing. Currently, they're the uninspiring standard magnolia, the same paint which was applied the day we bought our home. I'm very fond of grey and if we were in a larger home, I would love to go for a bold dark shade but alas, we're in a modern three bed, so a lighter shade will suffice. With kids and as it's an entrance way a paint that's durable is needed, something that can be easily wiped down and doesn't mark easily. We want to change the flooring in our entrance, carpet is something we quickly learnt wasn't ideal. I've always hand a love of Victorian houses and still dream of eventually owning one. I love the beautiful tiles that you usually see in the entrance and would love to somehow make it work in our own home. The traditional black and white tile I think would be too much, it's not a big enough space for it to have an impact. 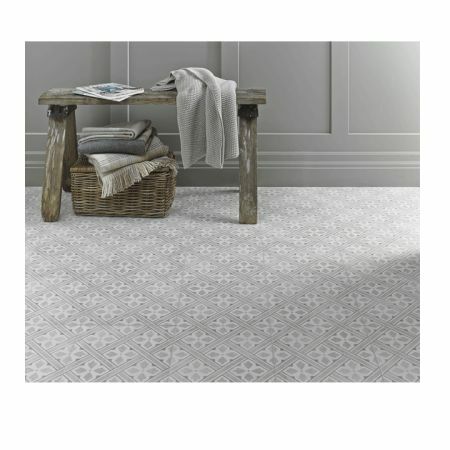 But I found these gorgeous tiles from tile.co.uk, I feel the softer colour of grey would be perfect. Storage is always my sticking point, I can't seem to find any furniture that will fit the space and work for us as a family. So, I've decided to look into making our own storage area. I love the look old scaffolding planks have and would love to use them to create a floor to cealing shelving unit. 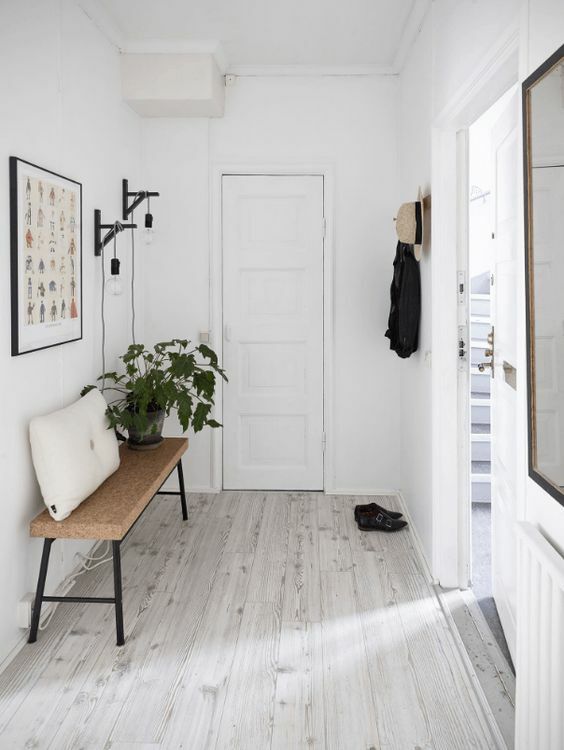 With baskets on the lower shelves, this will be the perfect place for storing shoes and bags, easily accessible and quick to clear away - clutter free hallway in seconds! If my master plan doesn't work, which in all honesty is a real possibility because I lack the DIY skills, I've had a look at Quercus Living and they have some gorgeous oak furniture which will work perfectly in this space. It will definitely take a lot of the stress away if I go for this option. The last thing to complete this space will be a wall gallery. But you'll need to stay tuned to see my ideas for this.